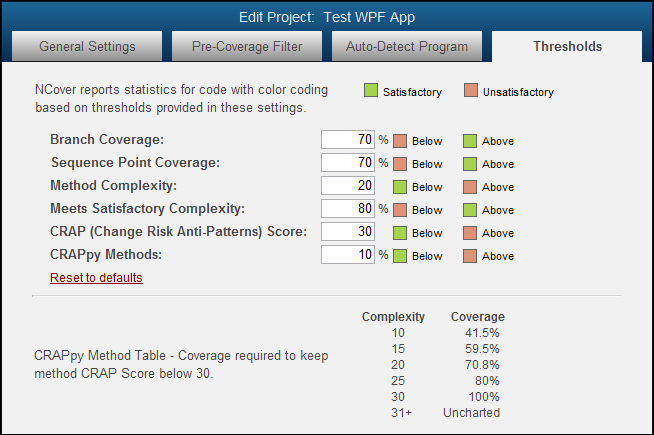 NCover means no configuring code coverage tools or plug-ins. From Code Central, you can monitor any number of build servers and/or desktops remotely and administer a repository of all their coverage data. 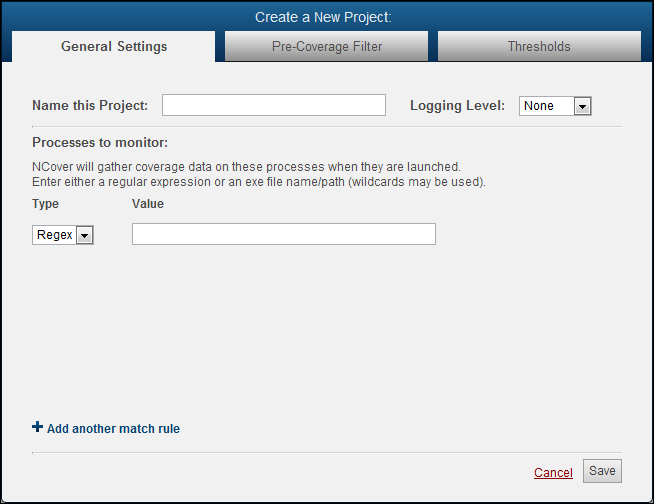 Code Central can collect coverage data if installed on the build sever, or remotely using Collector. A Collector installed on the build server and connected to Code Central will gather coverage data every time your tests run and automatically send the results to Code Central. From the "General Settings" tab, name the project and then use an Exe or Regex match rule to specify the test runner you want to monitor. For example, the Exe file path option for covering NUnit would be "C:\Program Files(x86)\NUnit 2.5.10\bin\net-2.0". The Regex option would be simply "nunit-agent", since the regex isn't case-sensitive. If you have a Collector linked to Code Central, your projects will be automatically synced and set to Enabled by default. 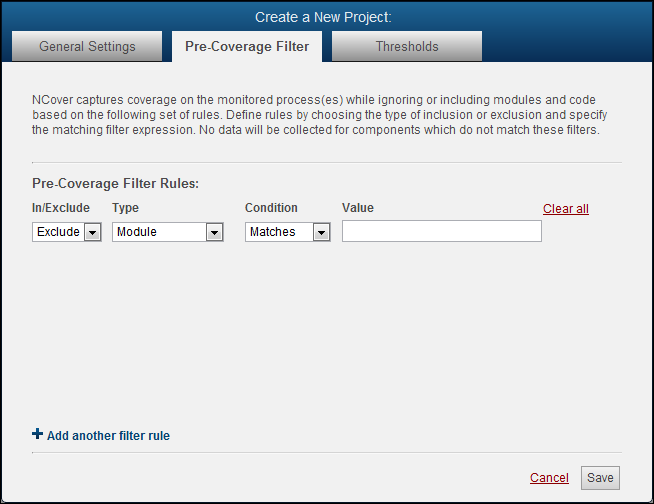 The runtime include/exclude functionality of NCover 3x has been integrated into NCover's Pre-Coverage Filter. You can profile only the code you care about and shorten collection times by specifying what assemblies Collector should or shouldn't be profiling. Collector will gather coverage on assemblies loaded by the test runner, but you don't usually want to collect coverage on third-party DLLs. Thresholds in NCover 3 were set for each project in Project Settings. Once you've installed a Collector on your build server to profile your tests, connect it to Code Central and it will automatically pull down the pre-configured project settings from Code Central. Since it's likely that you have more than one project on your build server that uses NUnit, having a Code Central project set up to simply monitor the Nunit agent would gather a confusing swath of data on unrelated projects. The new USE command for the NCover service will print environment changes needed for coverage collection to be assigned exclusively to one of your coverage projects. From the command prompt, the USE command prints out the SET statements that you need to incorporate into your build process. Then, you can manually set those environment values in your build scripting.